Named for the chopped appearance of his tail, Stubby spent his early life roaming the streets of Connecticut, USA without home or purpose. After wandering through an army training session at Yale University in 1917, Stubby was befriended by the soldiers and taken under the wing of one Corporal Robert Conroy. Such was their friendship that when the time came for the men to deploy to the Western Front, Corporal Conroy smuggled Stubby onboard the SS Minnesota in a coal bin, breaking a number of rules in doing so. Once the ship was far out to sea and past the point of return, Corporal Conroy revealed Stubby to the rest of the ship and was met with smiles and cheers from the other soldiers. But Stubby's presence was not applauded by everyone; Conroy's commanding officer was said to have been exceptionally angry when he learned about Stubby being onboard. This was to be short-lived as, without warning, Stubby raised his paw and saluted the officer, a trick he had picked up from the other men in training. Because of this unexpected gesture, Stubby was allowed to stay. He joined the 102nd Infantry of the American Expeditionary Forces' 26th 'Yankee' Division from that moment and served in France with them for 18 months. It is said that the 26th Yankee Division was one of the most battle scarred of the American military during the First World War and participated in the most intense fighting. Along with his division, Stubby partook in 4 major offensives including Aisne-Marne, Champagne-Marne, Saint-Mihiel, and Meuse-Argonne, and 17 brutal battles. For a solid month, Stubby and his comrades were under constant shellfire. During this time, Stubby's presence boosted morale and brought some comfort to the men of the division. At some point, Stubby was involved in a chemical weapons attack by the Germans and was nearly killed by mustard gas poisoning. Following his recovery, Stubby became very sensitive to the slightest smell of gas and was able to warn his men of an imminent attack. Charging up and down the trench, barking wildly and making every effort to attract the attention of the sleeping soldiers, Stubby gifted his men a few precious minutes to prepare themselves and find their gas masks. Stubby then retreated to a place of safety until the gasing was over. In 1918 at Schieprey, Stubby was wounded again, this time when a piece of shrapnel from a German hand grenade became lodged in his leg. After treatment by the Red Cross, Stubby made a full recovery and immediately returned to duty, earning himself 2 wound stripes for his efforts. Not only was Stubby able to detect a poison gas attack in good time, he quickly developed the ability to sense enemy ground attacks and give his men a chance to reassemble. What is more, Stubby soon learnt to differentiate between his men and the enemy by their language and their uniform. On hearing an English-speaking soldier injured in the field, Stubby would stand guard and bark loudly until the medics arrived. If, on the other hand, the wounded soldier was German, Stubby would be able to tell. Perhaps his biggest triumph came in September 1918 in the Argonne Forest when Stubby helped to capture a German spy that had camouflaged himself in the trenches. Recognising his language and uniform as German, Stubby chased the culprit down and held tight to him until the Americans arrived to arrest him. For his loyalty and courage, Stubby was promoted to the role of sergeant and was granted the Iron Cross - taken from the captured German soldier. During his time in France, Stubby acquired a number of medals and stripes including the Purple Heart, the Medal of Verdun and the Republic of France Grande War Medal. As you can see, Stubby was most often pictured wearing his chamois leather coat, emblazoned with these medals and honours. This coat was a gift from the women of Chateau-Thierry and was made specially after the Americans re-captured the town. At the end of the War, Stubby was smuggled back to American by Corporal Conroy and lived out his days as a celebrity, attending marches and conventions, staying in five-star hotels with 'no dogs allowed' policies and even attending the White House on two occasions. Sergeant Stubby passed away on the 16th March, 1926, in the arms of his comrade, friend and lifelong carer, Corporal Conroy. It is worth noting that unlike the majority of war dogs that were used by the Allies, Stubby was a non-pedigree, untrained stray, that was never meant to experience warfare. Yet, through sheer circumstance, he was able to prove himself as one of the bravest, most loyal and diligent dogs on the Western Front. Along with all the other animals that participated in the Great War, now is the time to remember them. I have a Staffordshire Bull Terrier and they are loyal, loving dogs, just as Pit Bull's are. They are not the sort of dog they have been painted. Love Stubby hope he lived to a grand old age and was spoiled rotten. This short story about Stubby the hero really touched my heart. It made me smile and made me sad, it once again goes to show what little heroes our pets are, always there with a wag of the tail and faithful to the end. What a fabulous story, thank you for sharing it, I will certainly tell others and make sure Stubby, like the other heroes, isn't forgotten. Really enjoyed Stubby's story - thank you for sharing it. Heartwarming story (although sad in places) giving a fascinating insight into our relationship with "mans best friend" proving their intelligence and unconditional loyalty. Lessons can still be learned from Stubby! What a wonderful story and to come through the war too. Stubby Conroy. I salute you Sergeant. I do believe there are no bad dogs but only bad owners. Stubby was lucky he found Conroy and they were devoted to each other through the hell of war and beyond as victors. Where are Stubby's medals and chamois coat today? Every adult needs a dog and every dog needs a companion. Truly a match made in Heaven. We are so lucky. Lovely story and I'm so glad they weren't separated after the war. It must have been hard letting him go. I really enjoyed reading about Sergeant Stubby, I have a dog myself and know how intelligent they can be. The club I belong to are doing a special event around WW1 I wonder if this story could be sent out to me in a word document? 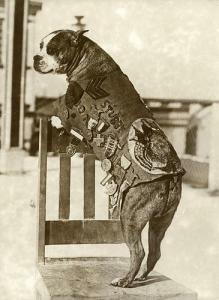 A wonderful story, good enough to warm the coldest stoniest heart, Sgt Stubby I salute you, you did your species proud! Lovely story. Who says dogs can't think for themselves? They truly are our best friends.